Signs of spring are everywhere. I am an avid gardener, and about this time every year I get a little antsy. I am a Colorado native so I know that the last frost day in Colorado is typically mid-May. I played enough spring soccer games as a child in driving snowstorms to know that it can snow all the way through April. But each year, the 70-degree days that grace us in late March trick me into thinking that this year we might just have a mild spring, and surely it is safe to plant my tomatoes early. Knowing my tendency to want to start too early, this year I tried to protect the lowly plants and seeds that I was so desperate to plant in early March by building a little greenhouse. It helps to have an urban farmer on staff who is always willing to share a few tips. On March 3, I planted my first vegetable bed and then snugly fit my new greenhouse over the top. I was sure that my new intervention would lead to the quick emergence of my first vegetables. Three days later I checked under the greenhouse and was totally dismayed to find that the entire bed had not sprouted as it had in my imagination. Three days. Most seeds take at least 7-10 days to sprout, but I swear I thought I would have inch-high plants after just three days because of the additional warmth provided by the greenhouse. Being realistic and patient are clearly not always my strong suits. I share this story with you because I believe that we will need both a strong sense of reality and some considerable patience as we wait to fully understand the impacts of state and federal health reform for patients and health care providers across the state. Without question we are starting to hear about some of the impacts of health reform efforts, both positive and negative. Right now, we are in the middle of the second phase of community engagement for our Health is Local project. Across the four communities—and even within a single community—we are hearing varied experiences with the impact of reform. Some providers have shared their joy at seeing a previously uninsured patient gain coverage and finally get access to the care they need. Some leaders have shared disappointment and frustration that some provisions of reform have not made an impact like they were expected to. Others still shared feelings of confusion and uncertainty, cautious optimism, or apprehension. Capturing these early individual and community experiences is critical, but to truly understand the full impact of the changes that are going on in our health care system we are going to have to be patient and wait for comprehensive research and analysis to fully describe the impact. We also need to be realistic that many things in our health care system still need additional reforms. We are just beginning to improve transparency in pricing and costs of care. There is still much more work to be done to improve patient engagement and the professional satisfaction of providers. 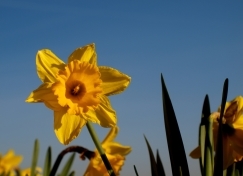 But, just as the daffodils on the south side of my neighbors’ house are always the first sign that spring is finally here, there are many encouraging signs that the changes we are making to our health care system are having a positive impact.